Much like stirring in a figure eight is the secret to keeping cheese melted in a fondue pot, the fondue pot itself is the secret to making life awesome. There’s something that brings out the child in you when you fondue, and that feeling is something too many of us let slip away. This is why I am here to tell each and every one of you to go and buy a fondue pot right now. The fondue pot has many purposes, keeping you slim, happy and entertained, but first, the fondue pot I use – the Trudaeu 3-in-1 Cheese Fondue pot – a slick medium-sized red ceramic pot on a wire stand, and it’s heated up by gel lighter fluid. There are a few different fondue pots out there fyi – cheese, hot oil or hot wine and chocolate – but my favorite by far is doing cheese fondue. There are just so many more healthy options when you use a cheese fondue pot. You can dip any kind of vegetable, fruits, breads, meat, oh my. You can make it incredibly low-cal too, and as a wheelchair-user this is always a good thing. What’s great about fondue to help you lose weight as well – it’s paces you, making it impossible to overeat since you have to rely on tiny forks for all of your eating. This can be annoying, but the struggle can pay off. A lot of clever dieters will actually use smaller plates to not eat as much, and small fondue forks work just the same. After you secure a cheese fondue pot in your life, your next goal is to practice using it. My fondue pot requires a gel-filled lighter fluid package to pop into the flame area so it can be lit. They also sell fondue pots that actually plug-in, but I love the live-flame so I have never gone the electric route. I do not trust myself to light my fondue pot however, so I always make sure I fondue when I have people over. This brings me to my next point of why the fondue pot is so awesome – it just makes you happy, kind of like that Pharrell song. Stupidly happy even, which by default makes it a great entertaining food, especially if you have the right dippers. Summer sausage, French baguette, green apple, steamed red potatoes, brussel sprouts and carrots, and that is just my first round. It’s also a super romantic way to eat. I made this for a new guy I’m dating and it was super fun. We cooked and ate together; mega-bonding ensued. Yup, the fondue pot can even help in the love department. 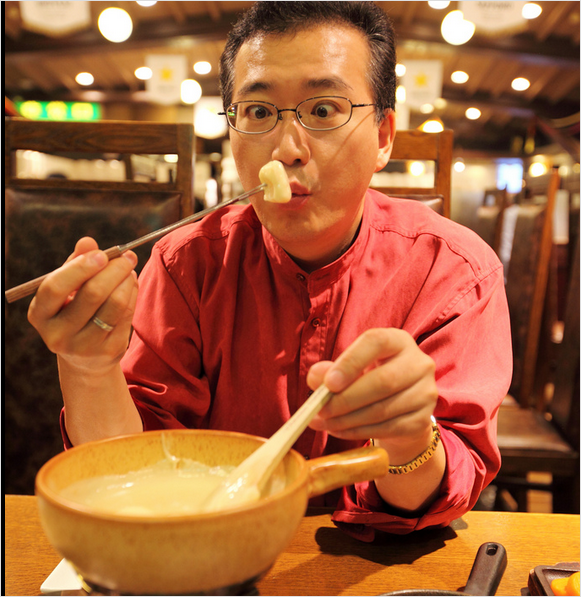 Fondue also forces you to eat non-processed foods, and that is where it may win the biggest. It’s easy setting up all the foods you need for a fondue feast, and they are all whole foods – no cooking required. Just buy them and set them on the table. It’s easy as that, and so good for you. And if you’ve never done a cheese fondue before, here are my pointers: Always use two different cheeses (a Gruyere and a cheddar or swiss is best), start it on the stove first and then put the cheese in your fondue pot, always use flour or cornstarch to help melt the cheese and last, make sure to add an acid (some white wine or lemon juice) to help your cheese blend smoothly. It may seem like a lot of work, but believe me cheese fondue is more than worth it. I think more than anything fondue puts a smile on my face. In a life where a disability can really bring on some difficult days, a silly little thing like this can have a surprisingly powerful effect on me, and I’m so glad – flameage and all – I discovered how influential it can be. Strangely, despite not being able to move my fingers I’ve grown to love cooking. I’m slow at it, the kitchen looks like an explosion everytime I cook and I’ve burnt myself countless times, but despite all of that I still cook on a near-daily basis. Not many quadriplegics do it, but I can’t help myself. It’s in my genes. My mom is one of the best cooks I know. I grew up always envisioning I’d be a fabulous cook like my mom, and I’m dead set on making that dream a reality. I will admit it’s not easy. A lot of considerations need to be made in order to cook without too much of a struggle. Good thing is that I have some experience under my belt, and I’m here to help. 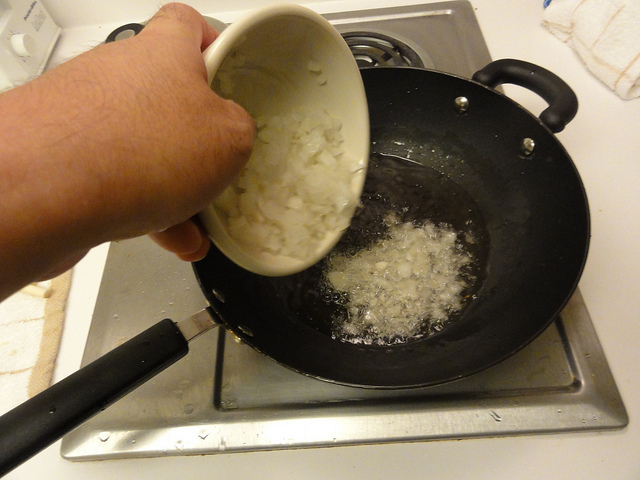 Check out my single-handed (and no finger-movement) cooking tips below. Safety in the kitchen is paramount and making sure you have your balance is huge when you’re cooking. If you have balance issues, this is the first thing you need to resolve in order to start cooking. I do the “quad-hook” to keep my balance, but other people prefer to use chest straps. Whenever you end up using, make sure it’s something you can count on. Since I can only use one hand very well while cooking, you can call me the spill queen. I don’t care what I’m cooking, some of it will end up on my lap (flour by the way is one of my arch enemies). Because of this – I love to wear aprons, but they’re not the easiest to put on when you can’t stand up. I cut the ties off my aprons since they’re not necessary (as I’m not standing). Easing, accessible solution. A really important thing you need to do before turning on the burners is to prep everything you’re cooking with first. It can take longer to do things when you’re arms and hands are compromised, so make sure you have everything poured, measured out, chopped, whatever, and put to the side just like a cooking show. This will make sure you don’t burn anything while taking too long to prep food. Don’t get too cocky and try to make something that you can’t cook on your own safely, say a pot roast in the oven and pulling it out when it’s done, and ending up spilling it on you. The best thing you can do is accept what you can’t do in the kitchen, be ok with it, and instead try to get really good at what you can cook. To make things easier, look for pre-cut foods is they’re available. Pre-cut vegetables, meats, cheese, potatoes; if it eliminates one extra step from your cooking process it’s a good thing. And don’t feel like it’s cheating either. You have a great excuse; you don’t want to overuse the strength in your arms over the years as you use them. To help your arms along the way as well, a sharp knife will do you good big time. If and when you do have to cut things, an extremely sharp knife at least will make the job a lot easier physically. A lightweight knife is good as well, such as a ceramic knife by a Cusinart. Maybe you don’t like cooking and that’s cool, but if you do, don’t ever let your disability stop you. I’ve even seen a high injured quadriplegic stir a soup using a very long stir spoon in his mouth; that’s the commitment I’ve seen to the love of cooking. With a little bit of planning, smart thinking and a few self-imposed restrictions, becoming a decent cook is possible. I’m living proof (and you should try my bread pudding). What cooking tips do you have? The other day a glorious thing happened. I received one of the most thoughtful gifts I’ve ever received from a man I was dating. And it was a Christmas gifts too. Love, love, love. He had wrapped four separate gives that were all intended for me, and all had a special purpose in which to make my life easier (that sure beat the unwrapped box of chocolate covered peanuts my ex-boyfriend got me last year). You see I love to cook. And if you look at some of my past blog posts you’ll see this to be true in all its glory. I can’t move my fingers though, just my arms and wrists, so that makes cooking a bit tricky; even a bit dangerous as the burns on my hands will tell. Because of this a very thoughtful person decided to gift me with a handful of gifts that all explicitly helped me out in this area of my life. Never had I ever received such a thoughtful gift before. Check out what he bought me below. If you have a hard time moving your hands, the last thing you need is a big clumsy knife that isn’t sharp. I never knew they existed before, but there is such a thing as a ceramic knife and they amazing. I would say the weight difference is about 65% lighter. That’s a huge change for anyone, let alone someone who can only move half of the muscles in their arm. He purchased a Faberware Chef’s Knife that’s ceramic.The one drawback to these knives is that they have a tendency to chip, so be careful when handling them and don’t let them hit anything too hard. Many people with disabilities are addicted to using straws, and I’m one of these crazy straw lovers. It all started in the hospital and I haven’t looked back since. They’re just so handy, especially when you can’t pick up a cup unless it has a handle (so lame). But any straw just won’t do. I really dislike flexible straws. When they’re in a cup and bent, the liquid always leaks out. One of my biggest pet peeves. The natural solution is getting straight straws of course, but finding these is not easy. It seems they’re going to the wayside with flexible straws taking over the world. But if you look closely in certain stores, they can still be found. My awesome gifter found straight straws on Amazon. Now I need like 20 more boxes. In an attempt to help me cook safely and with less burns, he next got me a Healthy Chef Baking Mat. This brilliant invention is made out of silicone and can withstand temperatures up to 428 degrees. While its original intention is to put it in the oven as a cookie sheet to make food healthier (it has raised mounds to encourage grease to drip away from the food), it can also be cut up and used as a shield from the heat. What we plan on doing is cutting a small piece to fit the outside of my hand, which is where a majority of my cooking burns occur. We’ll glue it to a Velcro strap back that will go around my hand to complete it. Can’t wait to show you guys how it turns out once it’s done. About 10 years ago I got smart and started buying acrylic dishware. I can drop it without worrying about it breaking. That’s a huge bonus in my world. Lately however I’ve lost several of my pieces. So my very thoughtful gifter also decided to purchase me an adorable acrylic cereal bowl. 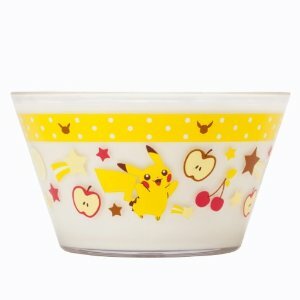 And he bought one in a girly print that makes my mornings a bit cooler now, a Pikachu bowl. Don’t you think I’m not appreciating this very thoughtful gift too. This kind of thoughtfulness is rare and doesn’t happen every day, even though every girl deserves it. What is one of the most thoughtful gifts you’ve received?